A fault tolerance cluster needs a minimum of two servers. Each server is totally a stand-alone deployment. 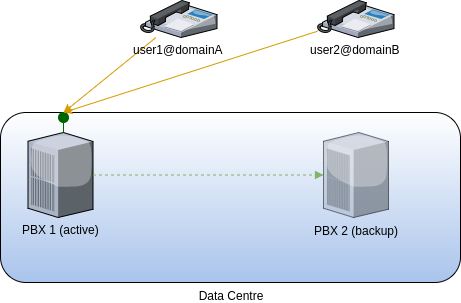 a backup PBX (PBX 2) that is a mirror of the active one. There are some scripts that sync the databases and the filesystems. Cheap to deploy. The load-balanced or high-availability clusters need at least five servers to work. In this case, the minimum is two. It can be seen as a stand-alone deployment, so all the functionalities that FusionPBX has will work out of the box. All the load hits a single server, so you should have enough muscle to support it. When the active PBX fails, you will be down until you change your DNS entries and you change your carrier's DID's IP's. If your DNS software and your carrier allow it, you may deploy a Nagios system that does the change for you. So far, I have not found any side effect. As I have already said, This is more a mirror system, one server will sync in periods of time against the other. If an event happens, the backup PBX will only lose some minutes of data, usually some voicemails and CDR records. When you change the DNS records and your carrier's configuration, the new active server will start working. 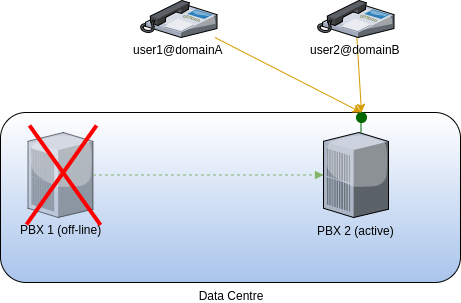 Do not forget this is a one-way sync when you recover the PBX 1, you must return it as the more accurate information will be there.